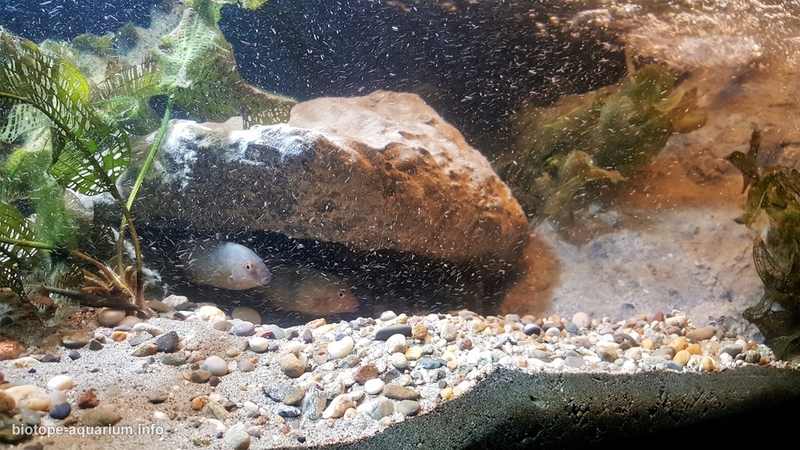 Description of decorations: In this aquarium were used large artificial stones and 150kg of gravel with sand, the largest stone measuring 60x40x20 that was positioned diagonally on the right of the aquarium, to allow the effect of riffles and a small waterfall. I set up the aquarium twice because of the strong current of the water, I can assure you that the 8000L / H pump in a 150cm aquarium moves all the sand following water movement. I have obtained the best result so that the pump’s input is on the other side of the tank with respect to the supply, so water does not circulate inside but moves the entire column of water like in a real river. After inserting the sand with gravel I always left the pump on at maximum, the day after I was amazed the substratum was naturally spread, with gravel spots where current is stronger and sand deposited where weaker. 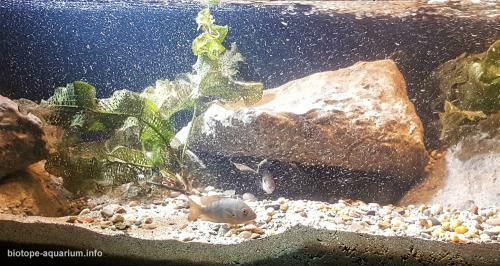 Description of equipment: In this aquarium there is not a biological filter, but only a Jebao DCP-8000 pump, an old t5 54w neon lamp and a 16w 30 ° 6500K led lamp. In fishroom I do not use heaters. Water parameters: pH: 8.0, 8.2, Temperature 26/27°C. Description of the area surrounding the biotope: The Amboaboa River 15 ° 57’06.21 “S 48 ° 43’24.28” E. 901 feet above sea level, also known as the affluent Ambomboa of the Mangarahara River, flows through mountainous areas with generally degraded savannah vegetation and is threatened by sedimentation caused by deforestation and soil erosion, pollution by agricultural fluids, invasive species, overfishing and drought. The river is superficial, clear, and the current is rapid. The substrate is generally rocky and sandy, with small waterfalls and numerous riffles. Width on date: 20 ‘. Width in high waters: 75-100 ‘. Nearest village / town: Amboaboa. Description of the underwater landscape of the biotope: Area is bedrock slicks with deep pockets and fissures with some loose stone, gravel in patches with some fine sand. Description of the parameters of the habitat: pH: 7.8-8.15, Temperatura: 76,5-85,0 ° F, Conducibilità: 160-280 µS. List of fishes and invertebrates occurring in the nature biotope: Paretroplus Nourissati, Paretroplus Kieneri, Ptychochromis Insolitus, Rheocles derhami, Arius festinus, Sauvagella robusta. List of plants found in the nature biotope: I did a little interview with John. Sparks and told me that he found Aponogeton but did not remember the species, then I checked the geographic range of all the species present in Madagascar, and I discovered that Aponogethon Madagascariensis is just in the region. Threats to the ecology: An important portion of the Mangarahara River and Amboaboa reservoirs that provide suitable habitat for endemic fish are now completely dry due to the construction of an upstream dam in the past and drought conditions in recent decades, or has very little seasonal running water. This has devastating environmental consequences including the severe decline and probable extinction of many endemic fish species as a result, the distribution of some of these endemic species (ie Paretroplus nourrisati, Rheocles derhami, arius festinus and Sauvagella robusta) is now limited to the upper reaches of the river Amboaboa, a small tributary of Sofia, where the habitat remains more intact with a more constant flow of water. The Amboaboa basin in the province of Mahajanga has been outlined as a new freshwater KBA for five threatened and restricted species of fish. Within the two focal areas identified on the species that lay and feed the land in the lower and upper river have been identified, however, it has been decided to delineate the whole basin as a KBA to be taken into account of the ecological corridor of the species . The existing Marotandrano protected area partially overlaps the sources of the river Amboaboa, a focal zone for the species of freshwater fish AZE Rheocles derhami and EN and CR Sauvagella robusta and Ptychochromis insolitus. The confluence of Amboaboa River with the Mangarahara River has been identified as a focal zone for the Paretroplus nourissati. This relatively aodynamic Paretroplus is about 16 centimeters (6.3 inches) in length and is closely related to P. lamenabe and P. tsimoly. P. nourissati is threatened by loss of habitat and invasive species. There are no apparent sexually dimorphic characteristics, but the males are larger. The nourissati are spawner substrates. A couple will dig a point in the sand and will spawn. The eggs hatch after a week. Paretroplus nourissati was first described by Allgayer in 1998. The genus Paretroplus is further subdivided into several groups called clades. The nourissati belongs to the clade consisting of fish that are relatively elongated and live mainly in rivers and flowing waters. The other members of this clade are P. damii, P. tsimoly, P. lamenabe, P. loisellei. The name of the genus Paretroplus derives from the Greek “para” which means “on the side of”; in taxonomy it is commonly used in generic names to express similarities or affinities.